These are some of the concerns expressed by Susan, owner of Gallier Home Child Care Center in Virginia, when she first began participating in the National Early Care and Education Learning Collaborative (ECELC) in 2016. At that time, the kids were served fruit juice, chicken nuggets, fish sticks and sugary desserts. In addition, the children at Gallier often exercised to kid videos, which involved more watching than moving. Susan believed the kids and her staff would not be able to change their lifestyle habits. 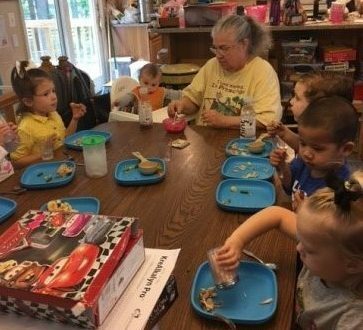 As Susan spent her time participating in ECELC, the Gallier Home Child Care Center completely transformed into a healthier program. Currently, the children only drink water and milk. Susan was completely shocked to hear that the kids don’t even miss the taste of juice. She incorporated family-style dining during meals and snack time and serves primarily healthy desserts like frozen bananas and date brownies to the children. During one of the ECELC learning sessions, a guest gardener also inspired Susan to create a garden and plant fruits and vegetables with the children in her center. “Parents are messaging me saying the kids are asking for home-cooked meals and eating things they’ve never even tried before,” she exclaimed. Susan began incorporating healthy lifestyles into her own home and lost over 40lbs since the beginning of the ECELC program. Keshia Waddell was part of the 2016-17 ECELC Family Child Care Home Collaborative in Indiana. Keshia shared materials and information with her sister who owns a family child care home in California. Together they implemented best practices. This handbook cites specific ways providers can support children in four areas: healthy eating, food safety practices, active play and limiting screen time.